Aryan Khanna (Shah Rukh Khan) is the reigning King of Bollywood. Gaurav Chandna (Shah Rukh Khan) is 25 years younger and is known in his colony as Junior Aryan Khanna. The resemblance is demonstrated in one awesome, heartfelt, funny talent show turn. 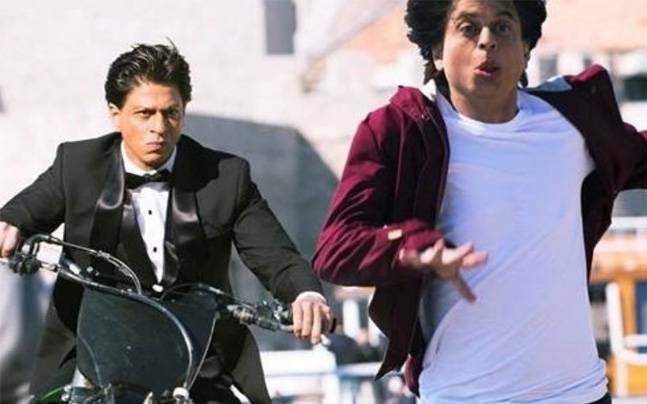 He is a superfan, rational in all areas of his life except where Aryan Khanna is concerned. Junior’s passion becomes as destructive as it was once supportive. Aryan says he owes his success to his fans, but he doesn’t want them in his life. Gaurav doesn’t see a distinction between the public persona and the man – he made Aryan Khanna a king, and he can unmake him. Do stars owe their fans anything more than being a star? And why do we care so much about professional liars and dresser-uppers? 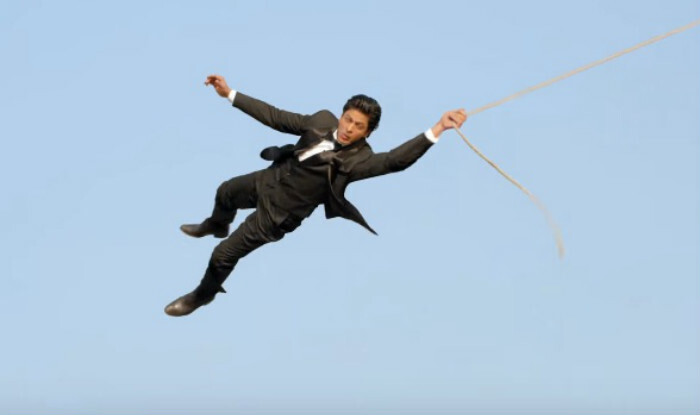 Maneesh Sharma gets a great performance from Shah Rukh, a veteran of the twofer deal. Aryan is the big star who lives in in a marble and crystal bubble. 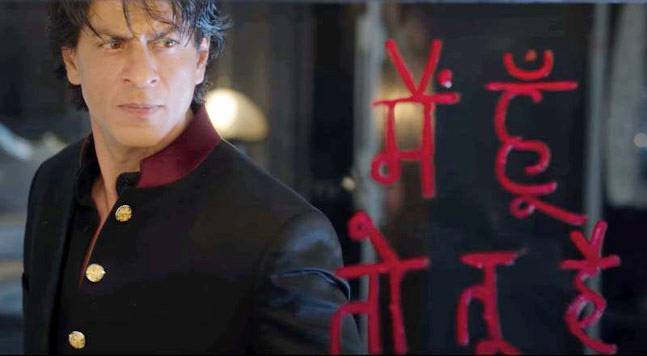 All the trademark SRK mannerisms are there – the sarcasm, the dimples, the charm. He lives in Mannat, his wife is called Gauri, he has kids, he gets paid to dance at big society weddings, gets into fights with other stars, is always late, has bad art, owns props and costumes from SRK films. But is he reeeeally SRK? That’s one layer of the game Shah Rukh and Maneesh Sharma play with the audience in this most meta masala. Gaurav is a youthful puppy faced Aryan lookalike. His characterisation goes beyond the fancy visual effects and body doubles to look like a young version of himself. Gaurav has a jaunty walk and several of his hero’s mannerisms too, but just a little bit off beat or jerky looking so it’s close but not perfect. When Gaurav is “doing” Aryan, his expressions change and his voice lowers in pitch to heighten the resemblance. 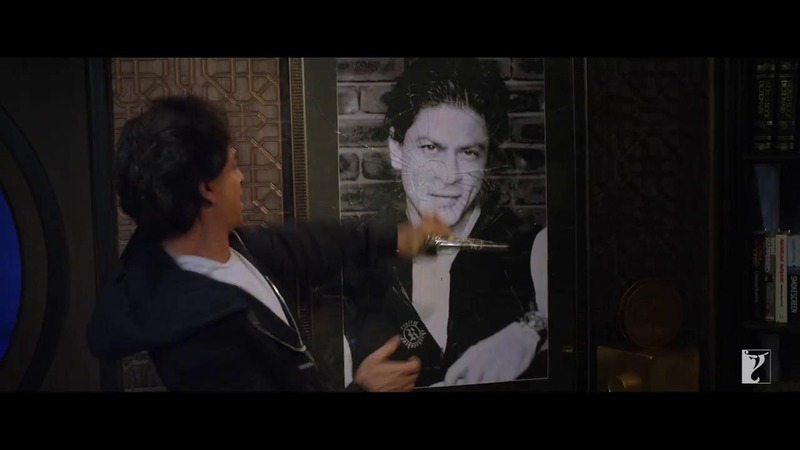 There is of course a supporting cast, but this is so much about the herocentric world of star and fan that Shah Rukh is in almost every shot. I liked Shriya Pilgaonkar as Gaurav’s crush, Neha. She is a pretty girl next door type and has a good rapport with the nervous and jumpy Gaurav. Yogendra Tiku and Deepika Amin are excellent and very believable as loving parents with a blind spot to their son’s weirdness. 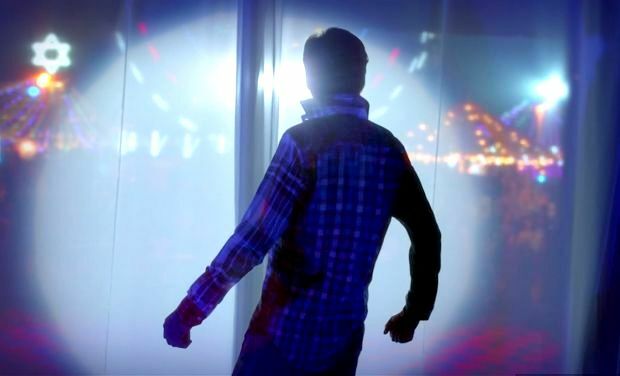 Manu Anand’s cinematography makes Fan look amazing. Bombay is the contrast of Aryan’s cool world with the grimy, seedy, well-worn and fabulous city, Delhi is the intimate and homely neighbourhood, and the Dubrovnik sequence has echoes of Bond. Gaurav has a great chase scene with the police in Mumbai where he leaps from window to window, hanging from canopies and AC units, eventually wrecking the tiffinwallahs delivery success rate by sending dhabbas flying. But guts and adrenalin can only take him so far, he stills gets nabbed. When Aryan chases Gaurav through Dubrovnik, it is beautiful as well as a pumping action scene. And Aryan has 25 years of being an invincible hero under his belt. There is a moment where had Aryan behaved differently, Gaurav would probably have gone home and calmed his farm. But Fan uses old SRK interviews to tell us that Aryan won’t step back from putting himself first, or he wouldn’t have been driven enough to make himself into a huge star. Aryan takes a swing at the press for missing the point and talking about his image when the real story was overlooked. Some confrontations with British police felt OTT to me in terms of the acting (is it just lame white extra acting? ), but my experience arriving in London probably doesn’t compare to, say, SRK landing at an American airport. Sharma also blends in footage taken outside Mannat and from the recent Temptations Reloaded tour. So Aryan is shaped by incidents that echo Shah Rukh’s past. It’s a smart way to both add cred and amp up the meta to stir up more questions. The visuals also convey both the inner worlds and the tension between Aryan and Gaurav. 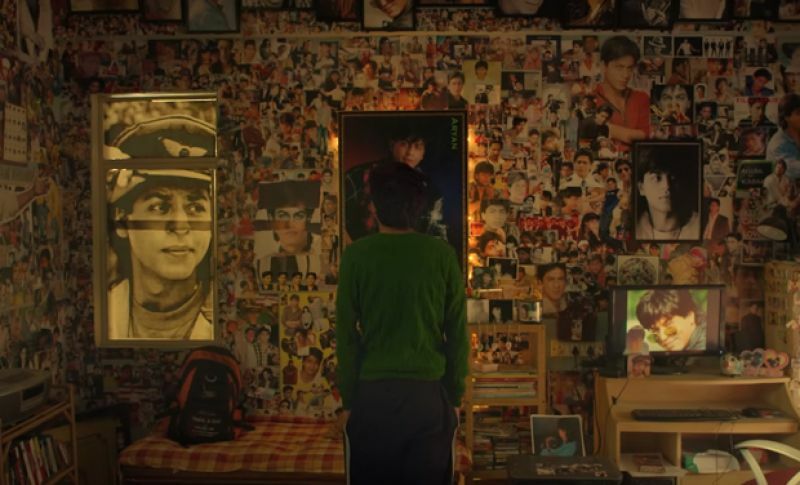 Gaurav’s room shows that Aryan occupies all the space in his life. When the crowds outside Mannat disperse, they leave detritus in their wake – thongs (I’m Australian, that is not as dirty as it sounds), paper, stuff – as the only sign they exist. When Gaurav waits outside to see Aryan on his birthday, the only thing he hears is his own voice. When the POV switches to Aryan, we get a wall of noise and a sea of faces. In one fight scene, the hate is palpable. Aryan really wants to hurt Gaurav, and Gaurav is too far gone to stop himself. As blows are traded their posture starts to mirror each other, almost as though one man was fighting himself. This is a smart film about the industry, about fan culture, and stardom. There is even a little thread about aging gracefully in the public eye (or not – maybe as one waxwork attests). There is temptation to read into every line and interrogate every symbol, but Fan is also a well-executed ripping yarn and entertainment. All the working bits of your brain can be happily occupied watching it. The Mahesh Fan’s verdict was it needed more songs, more dancing, and about twenty minutes less in run time. I can see her point, but that didn’t detract from my enjoyment. I am so happy I love, and am a bit disturbed by, this film. Nice one No-Show!